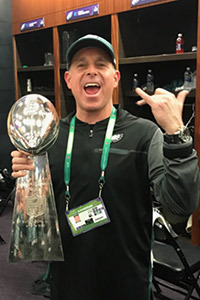 Doctor Brady has been practicing chiropractic for over 20 years and within that time, has been an active member for the Professional Football chiropractic Society for 14 years. More recently, Dr. Brady has been the chairman of the Professional Football Chiropractic Society for the past 4 years. He continues to push himself to deliver the best chiropractic care possible for his patients. Here at Bella Vista Family Chiropractic, we put our patients’ needs first. We believe that everyone, no matter what age, deserves the best possible chiropractic care. Chiropractic care has been gaining in popularity for the past decade, as doctors are realizing the endless amount of benefits patients receive from their adjustments. Regular Chiropractic care ensures that a patient’s nervous system is communicating properly. When our spine is misaligned, we experience immobility and pain all over our bodies. Proper realignment of the spine will keep us active longer and leading healthier lives overall. Here at Bella Vista Family Chiropractic, we believe in the science of Chiropractic care so deeply, we have dedicated our lives to bringing our knowledge and care to everyone who walks through our door. Contact us today to schedule an appointment.